Practice putting to shave strokes off your game. As many golfers know, good putting is what can take the most strokes off your game. During any 18-hole round of golf, the putter is probably the most-used club in your bag. There are some techniques and tips that can help you get the ball into the hole with one or two putts. Remember to practice putting before playing, because daily conditions such as weather and grass growth will affect the putting surface. Establishing a pre-shot routine is as important with putting as it is for your other shots. Visualize the shot you wish to make and check your grip, stance and posture. Square the club face to the target line. Look at the hole, and take a couple practice swings to get a feel for how far back to take the club for the distance you need. The putting grip should be different from the grip you use for other golf shots. One putting grip that will help prevent your wrists from breaking as you hit through the ball is the reverse overlap. Put the putter head on the ground and position your bottom hand on the club. Your thumb should point straight down. Then put your top hand on the grip and slide your hands together while placing your index finger over the fingers of your bottom hand. You may have noticed that many professional golfers place the ball on the green very carefully before a putt. One reason is that these pros are lining up the logo or name on their ball to the target line. This action helps you square the club face to the target line and hit a confident putt. 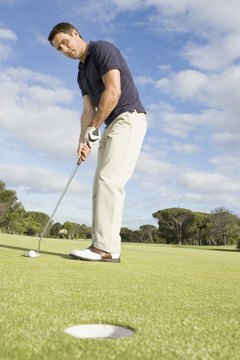 An easy way to keep your body still as your shoulders create the pendulum motion needed for a putt is to line up a dimple on the ball with a spot on your golf shirt. Make sure that the dimple and the spot stay aligned throughout the swing. Examine the contours of the green as you walk to your ball, and study your line from a couple of different angles. If the grass between the ball and the hole looks shiny, the grain is with the putt and the ball is likely to move faster than if the grain is against the putt. A wet green or uphill putt will make the ball roll slower, while a dry green and downhill putt will make the ball roll faster.